I recently reviewed this book for the online site I write for. 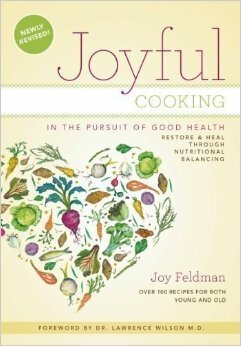 This review was originally published on BlogCritics.org as Book Reivew: Joyful Cooking: In the Pursuit of Good Health by Joy Feldman. Joyful Cooking: In Pursuit of Good Heath by Joy Feldman attempts to guide its readers to a healthy diet. In the face of conflicting opinions on what is good and what is bad Joyful Cooking defines the basics of a healthy diet with considerations to special dietary needs. Feldman had been diagnosed with an undetermined but debilitating autoimmune disorder. With medications causing severe side effects the author turned to nutrition to gain her health back. The nutritional balancing program emphasizes eating a majority of “best” and “good” foods, eating less of certain types of food, such as nightshade vegetables, and completely avoiding things like salt, bacon, and processed meats. An interesting point of interest in Joyful Cooking is that not all the “occasional” or “avoided” foods are obviously unhealthy. For example tomatoes, lettuce, winter squash, and canola oil all appear on the occasional list. Tuna, hot spices, red potatoes, margarine, and fruit juice all appear on the “best avoided” list alongside common culprits like processed cheese, artificial sweeteners, sugar, and white flour. The book is a resource for people who have special dietary needs, or suffer from conditions where a change in diet might improve health. Anyone could benefit from the book if they are looking to improve their nutritional health as Joyful Cooking aims to create a balanced diet that can be maintained forever. The chapters on getting started, weight loss, and eating away from home are quite helpful in figuring out what to eat. There are also chapters on what to eating during pregnancy and healthy eating for kids. There are quite a few recipes included in the book. There is even a special section for kid friendly recipes. I found the recipes to be appealing and fairly simple to make. The author also includes what recipes contain “inflammatory” foods so people with conditions like rheumatoid arthritis or IBD can avoid those ingredients. Overall the book is very informative and helpful for diet planning. There is a good amount of information on what not to eat as well as what to eat, which makes this plan easy to implement. Joyful Cooking is a good choice for those looking to improve their health through diet.